Being eco-friendly continues to become more and more of a goal for many outdoor lovers and what better way to do that than by recycling rain water? Rainwater is easy to collect and even easier to reuse in tending to your garden or landscaping. You can choose to create a rain barrel or buy one ready-made. Rain barrels are large containers that are placed beneath a gutter downspout so it can collect rain when it falls and hold it until you use the water. Rain chains are a fun alternative to gutter downspouts. Rain chains visibly guide water down chains or cups from the roof to the ground. 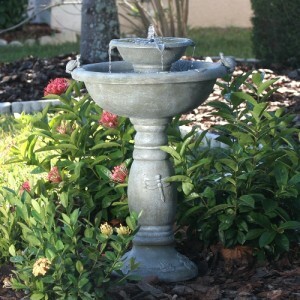 They create a beautiful water feature in your outdoor space. So what do they have to do with rain barrels? Since they take the place of a gutter downspout, you can place your rain barrel beneath one to collect water while making it a decorative, green feature in your yard. Once you have your rain barrel with rainwater collected, what do you do with the rain water? 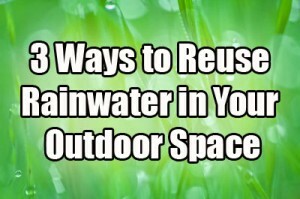 There are several options for using your rainwater, below are just a few ideas. 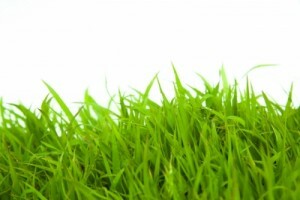 Grass can easily become dry and brown in the warmer months, by watering your grass with rainwater instead of city or well water; you will save in the long run while reusing the rainwater. Your garden can benefit from rainwater too while saving tap water for household use only. Rainwater is also healthier for plants because it does not contain the chemicals that city or well water often has. Do you have a fountain outside? Filling it with rainwater is a great idea as it will save on water bills and you can add some cleaners to the water to ensure your fountain remains free of algae and limescale.